This is the BEST FLAN you’ll ever have!! But this recipe is by far the best one I’ve ever tried. It’s delicious, it’s full of that vanilla flavor, and it’s so creamy!! and pour into prepared caramel sugar. any lumps. It works every time! My cousin shared this recipe with me over 30 yrs ago! I wrote it down on a 3×5 card and I still use it! I wrote it in Spanglish because that’s how she dictated it to me! it’s so fun to see their expressions when they see me coming up the walkway! You can also make it in little oven-safe bowls. This is the creamiest flan you’ll ever taste! The little caramel floating around it and on top is the best part, of course! Place 1 cup of granulated white sugar in a small heavy pot. DO NOT add any water or anything else. a few minutes and can burn very quickly so do not walk away! until completely dissolved. Immediately pour into pan or bowls. There is no need to butter or grease the pans. Pour into pan with the caramel sugar. Let it cool, but while it’s still warm run a knife all along the sides to loosen. the flan, but that wonderful caramel syrup that will overflow all around it. leave it in the fridge overnight. just as long as it’s halfway up the sides of the flan, you’re fine. I sure hope you try this recipe because it’s a winner! I’ve been making it for a long time and is a family favorite! If you’ve ever been to one of those bakeries, you know what I’m talking about. I thought I’d try making some just for fun. I had locked myself out of my house a couple weeks ago and the neighbors took me in, so I wanted to say thank you. I was cooking a meal for them and thought these pastelitos would be the perfect dessert. I’m so glad I did! It was so much easier than I thought and they turned out pretty close to the famous Miami version. First thing you have to do is allow the Puff Pastry dough to thaw completely (but make sure it’s still cold). 1/2 cup of sugar then simmer for about 5-7 minutes. Cool completely. I bought some Guava paste (not the jelly or jam) and sliced it into about 1/4 inch slices. I did the same with an 8 oz block of softened cream cheese. After the Puff Pastry thaws, cut each section into four equal parts. Fold dough over so that you form a triangle, using your fingers to “seal” the edges. being careful not to cut all the way through to the bottom layer. Brush the tops with the beaten egg… be gentle, you want the dough to rise in those beautiful layers. Repeat with the other Puff Pastry section included in the package. Bake in a 400* oven for about 20-25 minutes. Don’t go too far away. Keep a close eye on these, especially towards the end of the baking time… they can burn very quickly. Once they are golden, take them out and after cooling for about 3 minutes, brush some of that simple syrup glaze over them. They are delicious when they’re warm! See how easy that was?!! 1. Thaw dough according to package directions. 2. Make simple syrup by combining 1/2 cup of water with 1/2 cup of sugar in a small saucepan. Stir until sugar is dissolved. Bring to a boil. Lower temperature and allow to simmer for about 5-7 minutes, stirring frequently. 3. Place one of the puff pastry sections on a floured surface and roll gently where the folds were so that the dough doesn’t break when you’re shaping it later. Cut into four equal sections. 4. Brush edges with beaten egg. Place a slice of guava and a slice of cream cheese in the center of each square. Fold over, matching corners in order to form a triangle, pinching edges with your fingers to seal them so that the filling won’t spill out. Cut a slit on top, being careful not to go all the way to the bottom. 5. Place in a preheated 400* oven and bake for 20-25 minutes. Keep your eyes on these so that they won’t burn towards the end of the baking time. Cool for about 3 minutes, then brush each one gently with the simple syrup. Enjoy them while they’re warm! I GOT A NEW COMPUTER!!!!!! But my husband surprised me yesterday with a new computer for my birthday! And it’s not just any little old computer… he got me a beautiful, desk top Mac. I know!!! I couldn’t believe it! I STILL can’t believe it! It’s so much fun to work with! I’ll finally be able to keep up with the blogging world (including my own little blog), and I’m excited about publishing the Skillshare class I’ve been working on, as well as other things I’ve been looking forward to for a while but had to put on hold until I had a computer. Anyways… I know this is not an exciting post with a new project or recipe… but I was so excited I just had to share. Homemade veggie pizza has now become a staple in our house. I make it with a whole-wheat crust and pile on lots of veggies. It really is delicious. I’ll share that recipe with you at the end of this post. I hope you’ll try it – I know you’ll love it! Two years ago, this month, I began an adventure in a radically different (for me) health plan. I had a “routine” Dr visit which turned into a wake-up call for me. I knew I had to do something drastic if I wanted to feel better and avoid what could be terrible health issues. With the Lord’s help and guidance, this month marks two years that I have been on this health plan. I still have a lot to learn and there are days when I have to talk myself out of having a nice big slice of chocolate cake… But overall, it’s been amazing. I literally feel like a different person! My cholesterol is down, my sugar level is great, my good cholesterol is up, my blood pressure is much lower, I lost 25 lbs., I have so much more energy, …and the diagnosis I got at the Dr that day is no longer the same!! Another huge factor is that I haven’t had a migraine for two years!!!!!! If you knew me, you’d know that is amazing! That fact alone, was well worth the change in diet. I just thank the Lord every day for His strength and joy throughout this process, and look forward to continuing in this journey. I’m not going to write 10 posts about it, tell you what you should & shouldn’t eat… We all know what is healthy and what is not. I just had to share because I’m so thankful. I wish I had started eating this way decades ago. What a difference it would’ve made. But, I’m happy to have started and looking forward to growing in this process through the rest of my life. Take good care of yourself, friends. The saying “you are what you eat” is really true! In a small bowl, warm the water so that it’s warm when you dip your finger but doesn’t feel too hot. Add 1 packet of yeast, and sugar; Stir until dissolved and set aside for five minutes. Meanwhile, in a large bowl, mix the flours, and salt. Add yeast & water mixture, Add olive oil, and stir until well- blended. Add more flour if mixture is too sticky. Knead for 8-10 minutes. Place dough in a clean, oiled large bowl, cover with clean kitchen towel, and let rise for at least an hour. Punch down dough gently, and place on floured surface. I usually cut dough in half to make two 12” pizzas, but you can either use it for personal pizzas (6-8”), or one large pizza (18”). Now you can have some fun with toppings! I usually brush the shaped pizza dough with olive oil, sprinkle garlic powder, and add fresh ingredients: basil, artichoke hearts (my favorite! ), yellow zucchini, green zucchini, mushrooms, onions, sweet peppers, and anything else you want! I buy fresh mozzarella, and place some slices over the top. You can also sprinkle some oregano, and drizzle a little olive oil over the top. Bake it in a hot oven, 450-500*, for 30-40 minutes. The crust will be crunchy and the veggies will be cooked and delicious! Thank you all so much for the way you responded to my last post. It’s funny (not in a humorous way, but a thought-provoking way) how through this “blog world” I have made some unexpected friendships that have been a real blessing to me. I really didn’t expect a lot of response after not posting anything for six months! But you guys have just made me feel as if I got a hug from each of you! You didn’t have to do that, so it means all the more. I’m so looking forward to reading through your blogs and catching up on all you’ve been doing, and what’s been going on in your lives. s year I made three different things to go in the gift bags. Mini Oreos, dipped in white chocolate and rolled in crushed peppermint candies.. Mini Swirl Cinnamon Bread loaves… and Fudge Brownies. The mini Oreos are so easy. You just dip them in melted white chocolate then roll them in crushed peppermint candies. Place on a wax papered-covered baking sheet, and place in refrigerator (This will keep them crunchy). I was surprised how long they stayed fresh! They are a delicious treat! n came these mini Cinnamon Swirl loaves. Just use your favorite recipe, and you can add raisins, dates, or dried apricots – whatever you prefer. The key is to bake them in paper loaves so you can just wrap them up in cellophane after they've baked and cool. last but certainly not least, are the fudge-y brownies, made with dark chocolate chips, if you like that extra chocolatey goodness. These are my favorite!! s always fun to bake something a little extra special for people that you know could use an encouraging word, letting them them know that they are appreciated, their work is not in vain, and that they're loved. What are you baking today? Are you baking something sweet for someone special? Yes, I was skeptical, but it’s true!! And only three ingredients!! Can you believe it??!! Lately, I’ve seen all kinds of recipes on Pinterest for different things that call for 3-4 ingredients… pancakes, muffins, truffles, cookies, … After reading several dozen different takes on the cookies, I decided to add a few other things I need to have every day (according to my Dr.). Yep! All you need is 2 ripe bananas, one cup of quick oats, and your choice of 1/3 cup of raisins, dates, nuts, or chocolate chips. You can also mix it up and have a little of each. Today I used dark chocolate chips because that’s one of the things (believe it or not!) that I need to be eating! I know, I know, it’s tough but. . .
To make these cookies fill the bill for my dietary needs, I also add flax seeds (either whole or ground, but I actually like the “toasty” flavor the whole seeds give). I realize I don’t need to show you how to mash ripe bananas, but I shared this photo because I just love the color of the blue with the pale yellow… (always looking at things as if through the lens of a camera, sigh). Shape into a small ball. I got 10 out of one batch, but you can make them bigger or smaller, whichever you prefer. Flatten out gently and shape into a patty. (These cookies do not spread out). You can also place each small ball on the cookie sheet and use a glass to flatten out a bit. Now is when I prefer to add the “goodies”. On this batch, I placed the dark chocolate chips and small pieces of walnuts on each cookie as I shaped them in my hand. I used a greased, 12 inch pizza round because it fits perfectly into my small counter-top oven. Bake at 350 for 12-18 minutes. I actually left mine for 20 mins and they were perfect. Have them with tea, coffee, or cold milk. You can also add a spoonful of whipped cream, or drizzle left-over cream cheese frosting over the top. The possibilities are endless! Have fun baking these! Let me know if you try them and how you liked them. This dish is surprisingly easy and light, but so tasty! Thinly slice 2 large potatoes, and half a small onion. 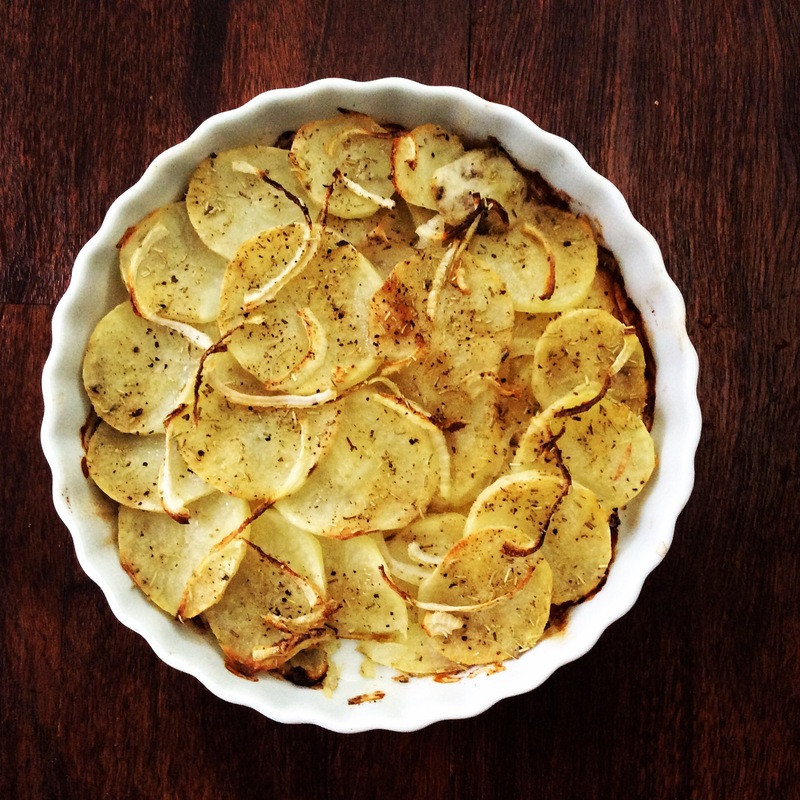 Fan out the slices of potatoes in a tart pan or pie shell. (You can add 1/4 cup of water if you like). Place the sliced onions over the top, and add a drizzle of olive oil over all. Sprinkle some fresh chopped rosemary (or dried), salt, pepper, and garlic powder. Bake at 375 for 30-45 min, until potatoes are tender. This is a delicious and light alternative to most potato dishes we see this time of year, (especially if you’re watching your fat or caloric intake). You can easily customize this to fit your family and tastes – add more potatoes, more onion, or anything you fancy.